Temporary employment agencies are popular among companies and professionals as they provide flexibility and options beyond the traditional 9-to-5 position. In fact, the use of contract and temporary employment has grown significantly since the Great Recession hit in 2007. For employers, temporary agencies offer the ability to engage qualified personnel on a short-term or contingency basis to replace staff members who have unexpectedly left the company or provide coverage during lengthy leaves of absence. Where workers are concerned, temporary employment gives a way to build experience, gain exposure to a number of different fields/specialties, or simply get a foot in the door with the hopes of parlaying temporary work into a full-time role. For professionals interested in going the temp-to-perm route, read the following advice to learn how to make a temporary job permanent. Ever heard the advice “fake it ‘til you make it”? That translates very easily to the temporary employment world. If you act like you’re going to be at the company for the long haul and don’t treat the assignment like a short-term gig, you’re more likely to be treated as part of the team. If you have a nonchalant attitude and present yourself as uninterested, don’t expect to be considered for full-time employment. In fact, if you don’t take the role seriously, you may quickly find yourself looking for work at other temporary agencies. Don’t be afraid to ask questions about your temporary role—your curiosity will let your supervisor know that you are interested in the position and eager to do a great job. However, you must be careful about which questions you ask. You don’t want to appear too nosy by inquiring about the circumstances that made the position available, but you can tactfully find out if the role has been a revolving door of temporary personnel (a huge red flag), if you are replacing someone on extended leave (who will return), or if the position opened up with little warning (making it necessary for them to reach out to employment agencies for temporary help). If it becomes clear that your temporary assignment will not grow into a long-term opportunity, resist the urge to give up and “check out.” You can still make valuable contacts that can serve as references for your continuing job search. You can also prove yourself to supervisors in other departments—just because your future doesn’t lie in one area doesn’t mean you wouldn’t be a great fit on another team. Remain professional in spite of your disappointment and make sure that you don’t burn any bridges before your temporary engagement ends. 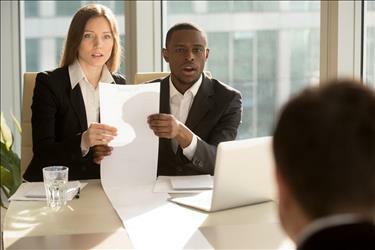 One thing that professionals often struggle with is how to highlight the experience gained through temporary work on their resumes without getting pigeonholed as a “short timer.” There are a few tips and tricks you can utilize to make sure that you portray your temping experience in the best possible light. Temporary assignments that were on a contract basis or lasted several months can be listed on their own. Shorter engagements with a number of different companies are best listed under the umbrella of the employment agencies that hired you. One important thing to remember: you do not need to list every single assignment you completed as a temporary employee. Only include the roles that will help your job search. 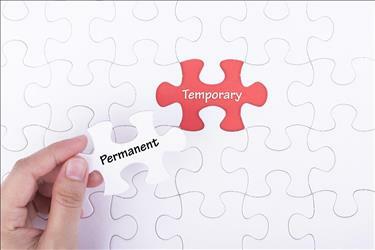 When Does a Temporary Job Become Permanent? Most temp-to-perm positions specify a certain time frame; three-month or six-month periods are both fairly common. 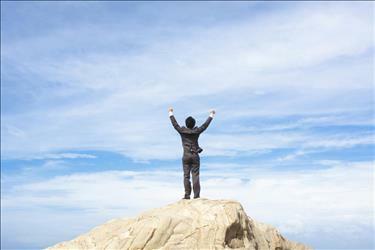 Once that time is up, the company may decide to hire you permanently or end the engagement altogether. Other kinds of temporary roles are a bit harder to predict. The company could be utilizing temporary employment to gauge the need for a full-time hire or they may have lost an employee unexpectedly and are using the assignment as a stop-gap. The best advice for temporary employees in either of those situations is to prove that they need your skills. If you wow your manager and the company decides to hire you permanently, you will be contacted directly by the company’s HR staff or your employment agency. If you’re in the midst of a temp role and the end of your engagement is approaching, look for clues as to whether you’ll be hired long term. If you’ve been receiving positive comments for your work, your prospects could be bright; however, if you haven’t received much feedback from your supervisor, it might be time to look elsewhere. If you’re serious about turning your temporary assignment into a permanent position, you have to make yourself indispensable. Prove that you deserve to be part of the organization’s long-term staffing plan by making significant contributions in your short-term role. Be patient and reliable, volunteer for extra tasks whenever the opportunity arises, get to know your coworkers, and find ways to impress your supervisors. Stay optimistic—positivity is a great trait to have, and your enthusiasm will go a long way to convincing management that they should keep you around. Don’t be afraid to discuss more permanent prospects with your direct supervisor, the company’s HR representative, or your employment agency contact. Feel free to ask for the job (but don’t come across as pushy).